help him. The great majority of men come from sedentary) occupations in civilian life and enter upon an active pedestrian great part is evidenced by the numerous examples of men disabled by foot trouble on the sick-list and awaiting survey. These men represent a loss of time and money to the government and are deadweights and incumbrances to the efficiency of the military machine. 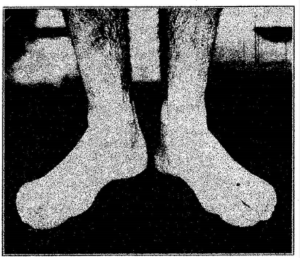 This is done to develop the muscles of the feet, especially under the arch in the sole of the foot, and is left to the discretion of the officer in charge, advised by the surgeon.